I receive so many comments about bathroom storage. Having lived in a few houses that offered little to no bathroom storage, I know the struggle. I thought I would share a few tips to making the most of a small bathroom. 2. Hanging a bucket or box from hooks on the wall, like these ones found at BHG.com, can add additional storage without using up any floor space. 3. Take down your towel bar and replace it with a few hooks. 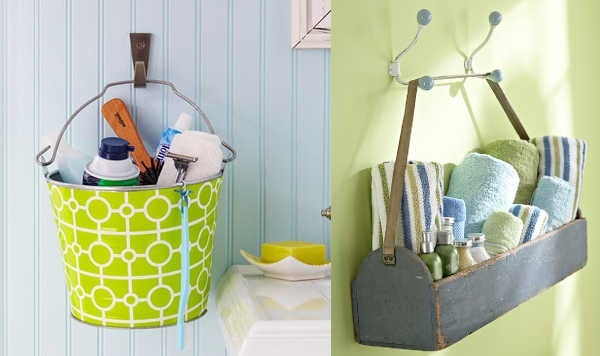 Hooks take up less wall space allowing you to hang up more towels or use the extra space for one of the ideas above. 4. Add storage to the inside of you cabinet doors. This will allow you to store items you use often in an easy to find place. 5. Take out a section of your wall and add storage between the the studs. This is a great way to add storage by using up unused space. 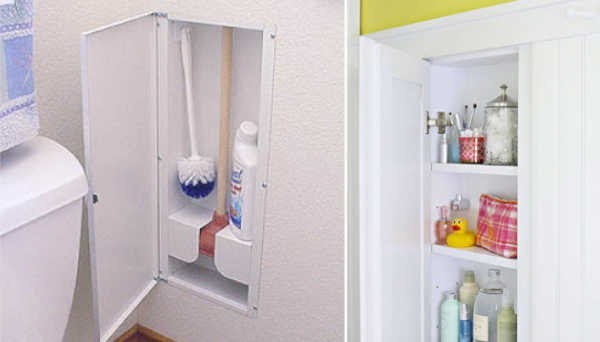 Use the area to store your toilet cleaning supplies or your shampoos and beauty products. Find stud storage boxes here. 6. Look up. 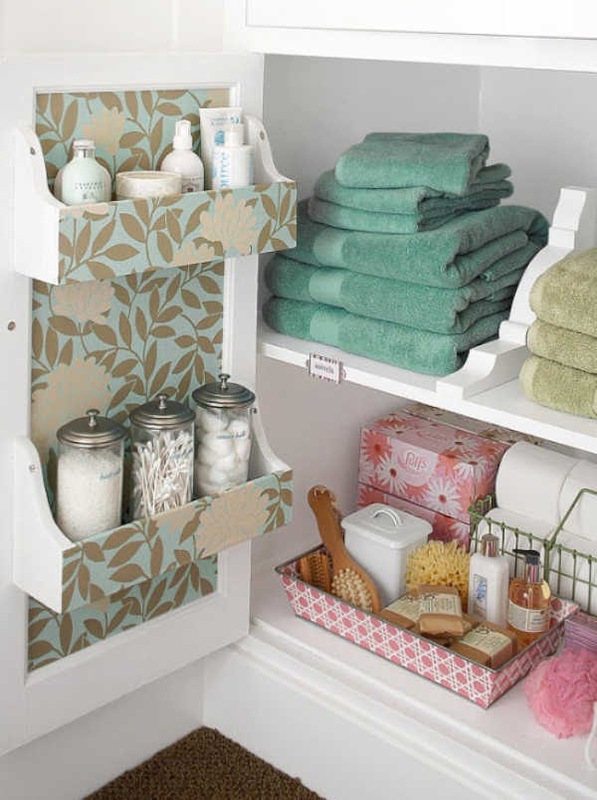 Adding a shelf above the toilet, door, towels, or bath tub can add a lot of storage space. Be sure to install the storage high enough so that no one will be hitting their head on it. What great ideas! 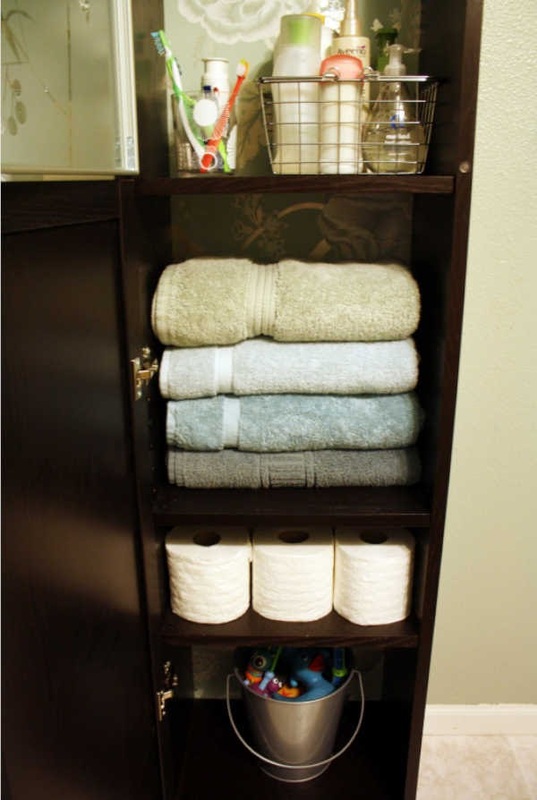 I have a small bathroom with no linen closet, and I'm always looking for ways to add mores storage to my bathroom! Great ideas for tiny room. I must admit ours has no space at all only a slim set of draws which fits perfectly into a tiny space by the sink. Great ideas, thanks for sharing!! The wall plunger storage is AWESOME! Thanks for all the great ideas! I am your newest linky follower! I would love to have you join my site too! I would love to have you link up to my "Homemade By You" link party on Wednesdays! Clever storage ideas. Thanks for sharing. I will be a new follower and link up to your Wednesday party. Great tips. And the matching photos are inspiring. Extra storage space is always welcome. where did you find the wall plunger cabinet? We so need one for each bathroom! Great ideas. I love the very last picture and it would be perfect in our small narrow bathroom. I LOVE that semi-built in shelf. Brilliant idea! I like the hanging boxes and buckets but the best idea of all has to be creating your own built-in storage space in the wall! 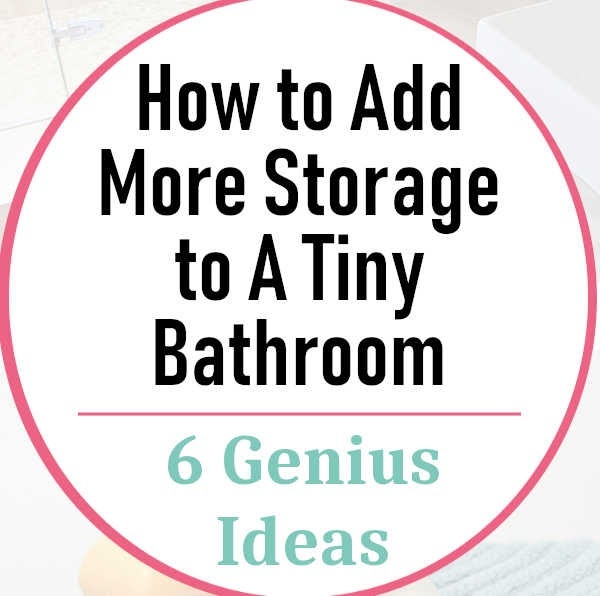 I would never in a million years have thought of that, but it's such a great idea when space is limited and is perfect for hiding away those ugly toilet brushes and plungers! Our bigger items, like our two kayaks and all the accompanying gear, we keep in our small storage unit. It's pretty handy and we spent a couple weeks looking for storage Basildon - we'd never be able to keep our kayaks otherwise in our small apartment, and it's not too far away for us to drop by at a moment's notice. I really like the towel shelf you've got going in that final photo. How high is that? Is it easy to reach? It is amazing on what you can do with very little space. I like doing DIY and making tight and small spaces look big and accommodate for items. Working for self storage facilities just adds my penchant of making small spaces look big. A little tweak to some of these ideas would help me maximize our own living space. With two young children, you could image the clutter we have, especially in the living room. I decided to have rolling storage containers (dark wood) for my children’s books or plush toys. With these rolling storage containers, it is also easier for them to put away these toys. Great suggestions! When it comes to small spaces, one has to do their best to efficiently maximize the space they have available. Little tips and tricks like the ones you've posted here definitely help a lot. And more importantly, a storage space also needs efficient ways to manage the clutter, or otherwise, it'll just get messy again. There are some very nice storage ideas here. Our bathroom is quite small and we have used the walls for hanging things from, and also built in tall thin cupboards and shelving above the door and cabinets. This frees up the floor space and makes the room look less cluttered but also gives us places to store our things. The built-in plunger w/accessories stud cabinet is great. Too bad no one can find it. The link you shared does not contain it nor anything like it.